Leading Manufacturer of pharma conveyor, packaging conveyor, flat belt conveyor, flat conveyor and automatic packaging conveyor from Ahmedabad. pickup these bottles/products and visually inspect the bottles/products and doing necessary action like primary packing, secondary packing, picking and placing at proper place. We have in stock for our international customers a wide range of Packaging Conveyors. 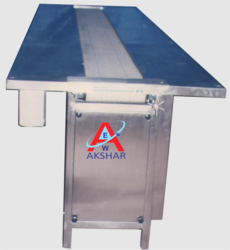 Offered range has stainless steel table top with moving endless sandwich belt in the center. Available in a spectrum of specifications, these conveyors are widely used in packaging industries. 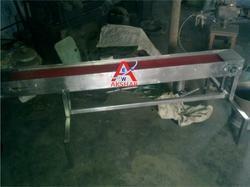 Customers can avail these conveyors from us at reasonable rates. Multi track conveying system either of S.S/denim slats.S.S. light canopy with black and white background is placed above conveyor. The SS Packaging Conveyor belt is having stainless steel table top with moving endless sandwich belt in the center. Tabletop is fixed to the same structure made out of SS square pipe and supported on adjustable bolts. Tabletop is of 12 inches working space on both side of the conveyor belt for final visual inspection packing. With the energetic support of our team of experts, we are engaged in offering a broad range of Flat Belt Conveyor that is famous in the market. These conveyors are specifically designed using the superior quality material in harmony with the universal quality standards. Offered conveyors are widely demanded in warehouses, shipping departments and other industries. These conveyors are made available in different technical specifications to choose from. We are one of the accredited manufacturers, suppliers, traders and exporters of a premium range of Flat Conveyor. Our range is widely demanded in warehouses, shipping departments and other industries. Also, our team members make sure that each design of this product complies with international standards so as to be sure of its efficient functioning. Looking for “SS Packing Conveyors”?